6/8 Cup of Coffee: Although half of Friday's games were not played due to weather conditions, there was no lull in total runs scored on the farm, as the three affiliates in action, led by the Greenville Drive and Aneury Tavarez (pictured), combined to score 39 runs in four games. 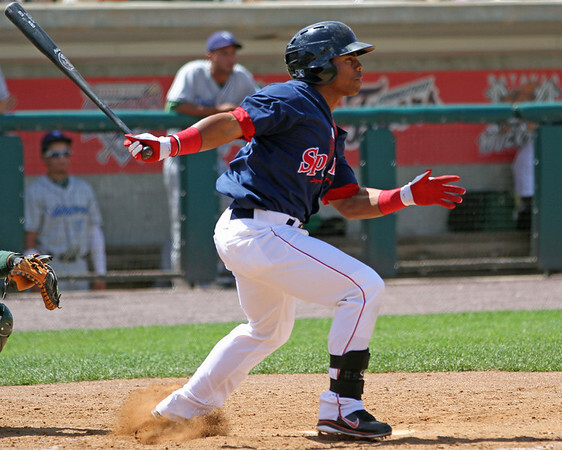 The Salem Red Sox's doubleheader was rained out, along with Pawtucket's contest. Portland was the only affiliate to score less than 10 runs in a contest Friday, as it fell 12-3 to the Akron Aeros (CLE). While the Sea Dogs only managed to scratch across three runs, the team accumulated nine hits on the day. Three of those hits, and all three of the side's RBI, came off the bats of Portland's eight and nine hitters, catcher Christian Vazquez and second baseman Heiker Meneses. Vazquez, who went 1 for 2 with a walk, collected his first RBI in the fifth inning on a single and his second on a sacrifice fly in the eighth inning. Meneses, who went 2 for 3 with a walk, followed up the Vazquez RBI single with an RBI single of his own. Ultimately, the story of the night for Portland's offense was one of missed opportunities, as the Sea Dogs left 10 men on base. Portland starter Charlie Haeger struggled in the game, surrendering six earned runs in six innings of work. Haeger was plagued by a four-run fourth inning, which was punctuated by a two-out, two-run double. Haeger, whose ERA rose to 4.54, struck out eight batters in the game. Following Haegar was Pete Ruiz, who gave up five earned runs in one inning of relief. Although it has been a rough season for the Greenville Drive so far, Friday was an occasion to celebrate, as the team exploded for 24 runs in its doubleheader victories over the Hickory Crawdads (TEX). In the first game of the night, which was a makeup of a rain-shortened contest from May 22, the Drive downed the Crawdads, 17-8. The game was picked up with the Drive leading 3-0 with two outs in the top of the third inning. With the bases loaded, left fielder Alex Hassan, who originally did not start on May 22, clubbed a pinch-hit, bases-clearing double to increase the Drive lead to 6-0. Greenville never looked back, adding five runs in the fourth and three each in the sixth and seventh innings. Two other players that stood out were Tavarez and designated hitter Drew Turocy. Tavarez, who played right field, went 3 for 6 and was just a single short of the cycle, while Turocy went 3 for 4 with a double, a triple and four runs scored. Right-hander Austin Maddox was the first Drive pitcher to appear in the game on Friday when he started the bottom of the third inning. Maddox pitched five innings in relief, giving up four earned runs and striking out three batters. The winning pitcher for the Drive was Yunior Ortega, who did not throw a single pitch after the game was resumed. In the second game, a seven-inning contest, the Drive bested the Crawdads again by a score of 10-5. Both Turocy and Tavarez carried over their strong performances into this contest as each went 2 for 3 and picked up a combined nine total bases. Second baseman Mookie Betts continued to build on his torrid May this month, going 2 for 4 with a double and a run scored. Betts, who hit .356 with 19 extra-base hits in the month of May, is currently hitting .462 and has collected five runs in three June games. Drive starter Francellis Montas struggled in four innings, giving up five earned runs and eight hits. Gerardo Olivares pitched solidly in relief, though, giving up zero runs in three innings. The DSL Red Sox moved to 5-1 to start the season after a 12-1 win over the DSL Athletics. The DSL pitchers, led by starter Dedgar Jimenez, combined to give up only seven hits and strike out 10 in nine innings. Jimenez, who pitched four innings, gave up six hits and struck out five batters. Offensively, the Red Sox picked up 12 hits and were led by left fielder Raiwinson Lameda, who went 3 for 5 with a double and a triple. Right fielder Franklin Guzman, third baseman Gerardo Carrizalez and catcher Jhon Nunez also had multi-hit games. Nunez picked up three RBI on a bases-loaded triple in the bottom of the seventh inning. Player of the Day: In nine official plate appearances in Friday's games, Drive right fielder Aneury Tavarez went 5 for 9 with two doubles, two triples and a home run. The 21-year-old Dominican, who added his seventh stolen base of the season, has produced a .255/.294/.409 line so far this season.